Check out our Smite World Championships photo gallery. I stood in a showroom and spoke to a group of four friends who had driven from Colorado or South Dakota or some place like that to Atlanta, the site of the Smite World Championships, and they told me that they almost died getting here. I asked if they played the game, and one kid said that out of the four he was the only one who played. I asked if they were really into the streaming culture, and they said not really. The celebrities? No. They said that this was their second year in a row, and that last year they had almost died trying to drive straight through. Why were they here? It was something that they wanted to do. Smite, like many games in the MOBA genre, is predominantly played on the internet. Its fan base is spread around the world, and they’re connected through the wide weird web’s game streams, forums and YouTube VOD capabilities. The chances for those fans to interact in person, like other so-called nerdy activities, is limited to the events that the world creates for them (or that they create for themselves). The fierce protective tendency that many people have over events like PAX and DragonCon is deeply embedded in that feeling. If you like football, you can live your dream weekly if you’re willing to do a little travel; if you like tabletop roleplaying, you have to wait for some annual events. When some nineteen-year-old dude tells me that he drove across a country two years in a row for a four-day event with three friends who don’t even play the game, I have to take that as a serious cultural event for those people. When I spoke to them, they were waiting in line to play Smite in some booths at the championship itself. It’s a fully-integrated experience for them. Weirdly enough, in my two days at the four-day experience, I found it to be deeply rooted in the body. I sat in the dead middle of the audience during the opening match of the semifinals. I listened to a theater full of people laugh at the dad jokes of the announcer. I felt the echo of a thousand voices singing to a player on the team Enemy. He was celebrating his sixteenth birthday. I heard the roar, and my god it’s an actual roar, of the crowd when the preroll announcing the players of Enemy and Paradigm appeared on the screen. That preroll and the match that followed felt half like an exciting spectator sport and half like The Hunger Games. The opponents stood on stage and traded quips like cartoon heroes and villains, with the face and heel cheers and boos to match from the crowd, before hammering into one another in a very abstracted way for three hours in front of us. None of the competitors look a day over twenty (which isn’t to say that they aren’t older, but almost every single one of them is shockingly fresh-faced). The crowd livens up when a kill happens. The crowd goes silent when the casters are trying to make this incredibly complex game sensible for them. I listen to the people behind me talk about the decisions that the players might be making, but my paltry fifty or so hours in Smite lets me know that they don’t really know what they’re talking about. The sound goes up, the sound goes down, and when a team gains an advantage the thundersticks smash together with the furious intensity that only a MOBA fan can bring. It’s disarming and strange, but there’s no artifice to it. There’s production, but I don’t get the feeling that any of the emotions are crafted in a PR laboratory somewhere. You know what I mean; you can tell when a fan world is being forced on a group of people. It’s palpable when people are being told to care versus when they actually care. There’s an intensity of connection here that doesn’t even read as sensible to me, let alone something that I can engage in, and I’m left wondering why. I couldn’t stay in the theater for long. Hundreds of people screaming is never my thing, and there was something strange and mystical about all of these people surrounding this shrinelike screen. The room was dark, and a blue glow lit their faces. It’s like sitting in a bedroom watching a stream with hundreds of your closest friends. It’s the gamer’s room blown out to its most extreme proportions. I didn’t leave the room because it was unnatural, or “too nerdy,” or too strange; I didn’t like being there because of how natural it all seemed. The competition was beautiful, of course, and the safety of screens distributed throughout the venue meant that I always knew what was happening or who was winning. When the athletes came out to give their press conference, I was assured that the competition was strong and fierce. At one point I took notes of what they said, but at some point those notes became different versions of “these people look distraught.” The second place team, Enemy, looked physically harried after their loss 3-0 at the hands of Epsilon. Their captain didn’t come out initially. When he finally appeared, his eyes were bloodshot. Everyone looked like they had been attacked by a hammer. The Smite World Championships were bodily. They took something out of me, the fans, and the players. It’s a beautiful game to watch, even if it’s entirely inscrutable to someone who can’t trace its user interface, but all that screaming energy has to go somewhere in the cold rooms. Where does it go? Sucked into a machinery of balletic competition? Nevermind that. 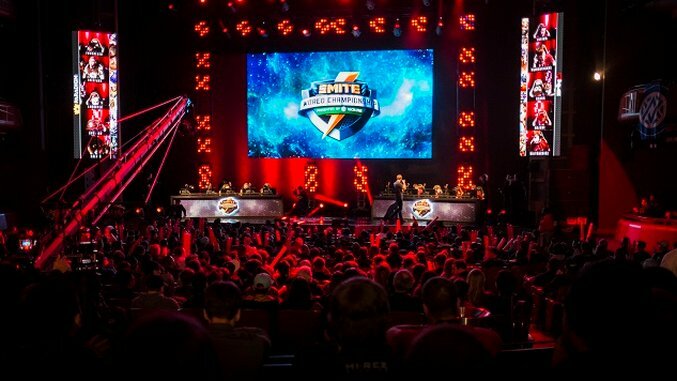 The teams played, the prize money was doled out, and the Smite community is sated for another year. They will come together again, next year, to celebrate the game. There will be more prizes. Someone else will pick up the massive hammer in victory. More fresh-faced young people will sweat with smiles or frowns in front of an inquisitive press.